I’m sure that I have mentioned this before, but if you plot the locations where cacti have been recorded from on a map, you end up with the road map of the area. Mex101 comes into Jaumave from the north and leaves it to the south. There are literally hundreds of cactus locations reported along this road. 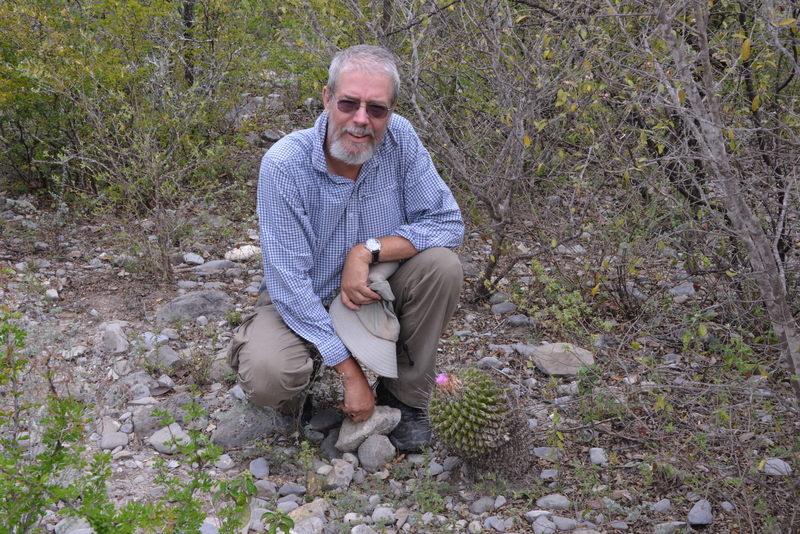 The list of plants from these locations shows some confusion among the explorers that visited here – lots of names, especially for Mammillaria, but at times I think that a particular plant has been mistaken for another similar plant, which is then listed. 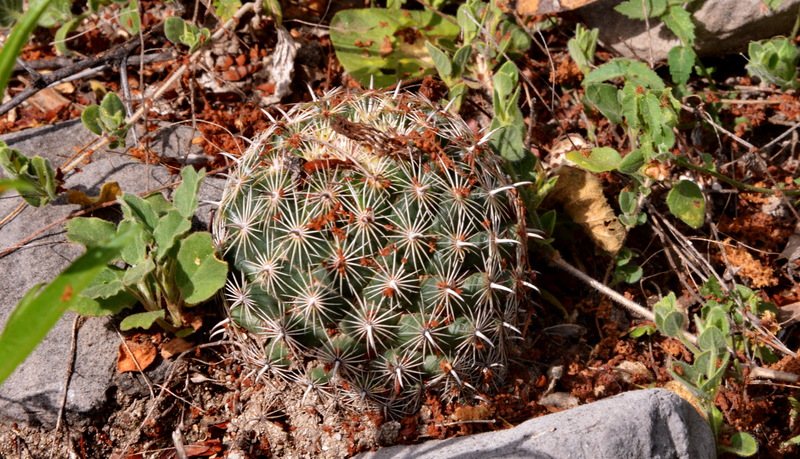 As I mentioned before, I don’t claim to be an expert in naming Mammillaria, especially those in nature, although over the years I have grown (and killed) most of the taxa – I find it difficult to combine long spells away from home, with giving plants in my collection the care that they deserve. For now, while my health permits me to travel to habitat, I’ll focus on taking their pictures in nature, while replacing the gaps in my collection each September at ELK. Studying the maps last night, Cliff spotted a road to the El Cielo Biosphere Reserve that was founded in 1987. It seemed that we were the first visitors there, certainly among cactophiles. The main interest for visitors seems to be the birds, of which Ian claimed to have spotted several species – a great source of leg-pulling by Cliff and I as he claims to have seen birds such as the lesser spotted upside down red legged hawk eagle – but without images to prove it! Show us the pictures, Ian. We believe that he has been taking lessons from Mike Harvey who has entertained us on past trips with his years of bird watching experience. There were no cactus locations reported from this area, so either there were none to be found or nobody had bothered to report their finds. The first stop, (S3110) proved the latter and I will try to make up for the lack of data by providing a full list of the cacti that we photographed at the seven stops we made. By two o’clock we thought it wise to return to the hotel, as we had been on the road since 8:45. It only took us 45 minutes to get back, which indicated the time spent dodging plants with hooks and spines but not of the Cactus Family. And also the time we spent trying to get out of town. It is not a large town but with lots of one way systems and no signage to help until we were well and truly out of town, this can be a real challenge. Cliff and I recalled the day that we had spent the whole day driving around Arequipa, Peru without succeeding to find the way out – not one of our prouder moments! For now, I’ll limit myself to the highlights, plant wise, at each stop. The whole day was spent on a fair to good gravel track, driving through a low forest, similar to the Catingaa forest in Bahia, Brazil. S3110: Just a random ‘let’s stretch our legs’ stop without much hope of seeing cacti. We saw Ferocactus hamatacanthus, Coryphantha delicata, Echinocereus pentalophus, Cylindropuntia lepticaulis and a large padded Opuntia. We came back to the car, now covered in dry leaves and Acacia flower remains, probably Vachellia (Acacia) rigidula, with arms and Cliff’s legs covered in more scratches and with Cliff playing host to a small stick insect. S3111: This stop will be remembered for the giant Thelocactus conothelos plants mostly in fruit (not yet ripe) and some still in flower. We all took turns to pose next to the largest plant to provide an idea of scale. Ian also spotted a group of Ariocarpus trigonus, mostly recovering from having been chewed on by cattle or goats, but with one nice specimen plant. It was here that Ian spotted one young seedling with pectinate spination that we all agreed looked like a Turbinicarpus sp juvenile. Since our trip, Ian believes he has tracked this down to Neolloydia grandiflora, an old Fric name, now considered to be a synonym of Neolloydia conoidea. Close examination of our images back home also reveals individuals with the typical dark central spines, but not until much later in life and always on areoles high up on the stem. It is also remarkable that although we saw plenty of Neolloydia, right from the second day in the field, these were the only ones in flower. I’m surprised that the name has been sunk despite these distinguishing features, probably the plants in habitat are just not sufficiently known. For me, it is distinct enough from N. conoidea to deserve a (cultivar) name, but probably not sufficiently distinct to be considered a different botanical taxon, so Neolloydia conoidea ‘grandiflora‘. What ever its name, they are cute floriferous plants in habitat and deserve a place in any small glasshouse or windowsill collection – raised from seed of course. 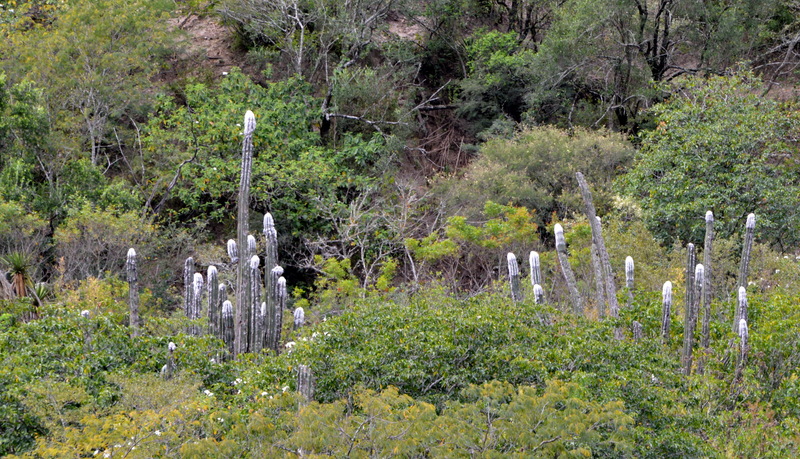 S3113: I have already mentioned similarities with the Brazilian Caatinga forest and this was enforced by the cephalia of Pilosocereus leucocephalus poking above the low trees and shrubs. Here the plants had come to the track, so the stop was to take their picture. Not sure if I even got out of the car. S3114: At previous stops we had already seen a number of Mammilloydia candida, many of them in flower. There were some white spined clumps that were not in flower and looked different. 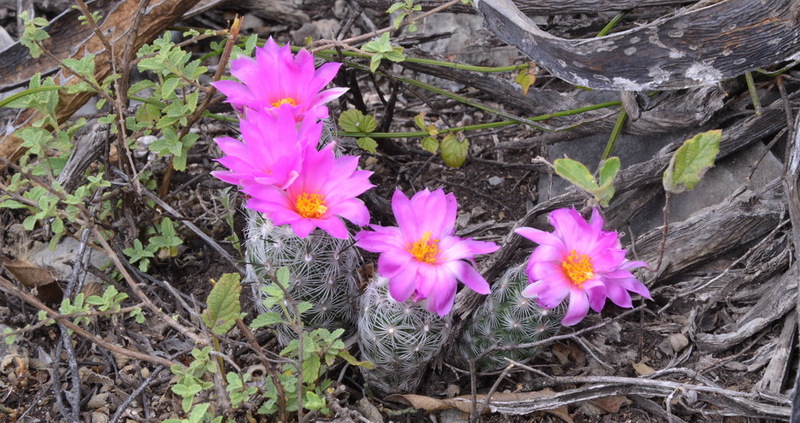 Here we saw them with dark pink – mauve flowers. Michel Lacoste reports Mammillaria klissingiana from near Jaumave and I believe for now that this is the ‘other’ white Mam. we saw. Jatropha urens,from the Euphorbiaceae family, the one with the evil stinging leaves, stems, everything, was here – good to avoid. 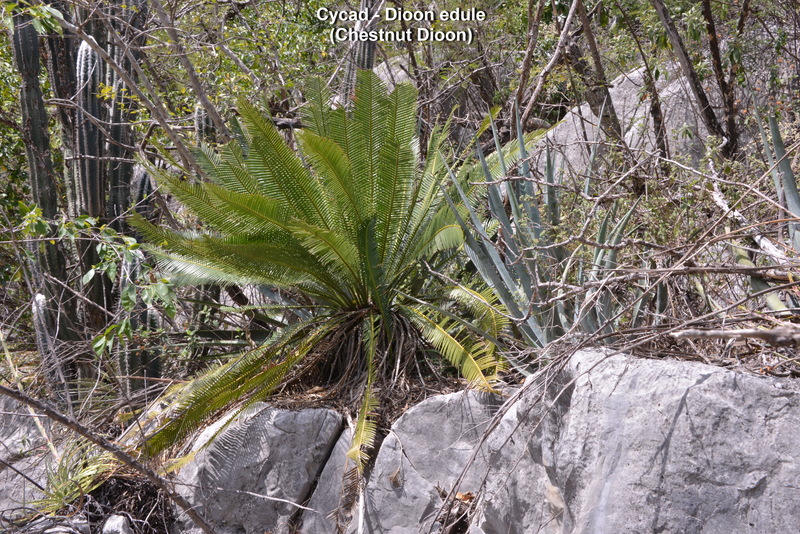 S3115: Walking into a dry river bed, we spotted large Cycads and their younger siblings – no idea what species. 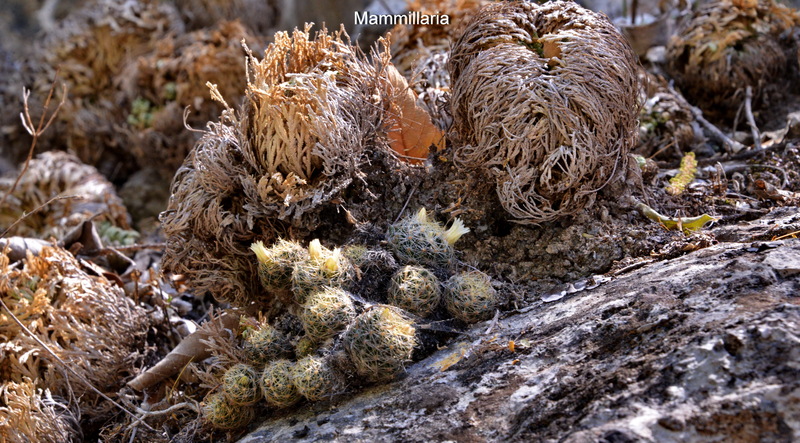 Yesterday, Ian found two small Mams that I’m calling Mammillaria melaleuca for now. We saw more examples today, but here, Ian Eagle-yes found a small group in flower. The bright yellow flowers seemed to confirm the Dolichothele group, but the flowers seemed much smaller than what I have seen in cultivation in Europe. Special selection by nurseries for larger flowers? Or just the wrong name? I hardly had the chance to open my bottle of drink when Ian called for another Stop – this time for a tree with some large Tillandsia growing on the branches. This was so near the previous stop that I’ll use the same number. S3116: was really meant as the place to turn the car round, but why not take a look at what grows on the rocks as the dry river bed again crossed the road. Much the same as before, with a very nice M. candida in the shade, in full flower. And a strange ‘upside down’ Opuntia that had given up the will to grow upwards and was thus hanging down. A new species? 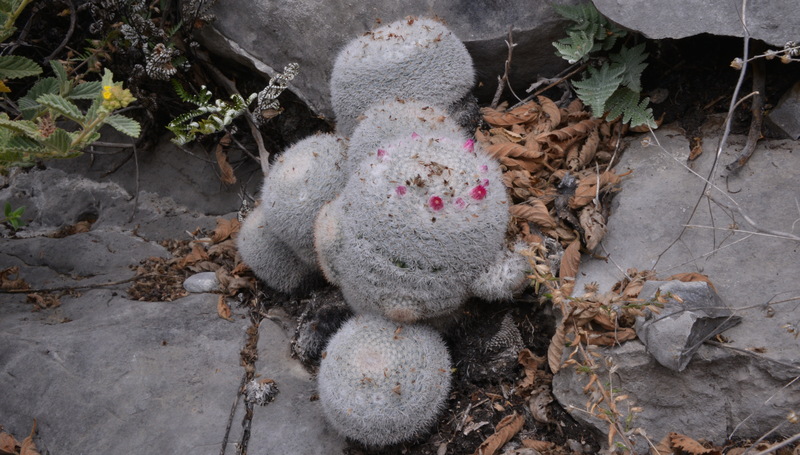 Cliff and I agreed, thinking of Trichocereus bollingeriana in Chile where some stems of a plant hanging down seemed to justify a new species name; not for us. On the way back to the car, on a ledge right below the nice M. candida, Ian pointed out yet another ‘different’ Mam. M. wildii? Oh, we’re going to have fun at the Mammillaria Society AGM with no end of ID challenges for the members! Later, while I was writing up these notes, one of the workmen building the hotel around us explained that the weather is not always this nice. In December they experienced -7C and 30 cm (1 foot) of snow. It’s nice to know what these plants can put up with in nature? Of course there are other factors to consider – moisture, humidity, the length of the frost and the maximum temperature for that day. And are such events regular or rare exceptions? Many of my cacti have died just after one night of a sharp frost in an unheated greenhouse, but then the day time temperatures never rose much above 2 C. while in nature it can rise again to 10 C or higher. We considered Neolloydia, but elsewhere we have seen lots of Neolloydia, all with ‘mature spination’ while here 99% had ‘juvenile’ pectinate spination, with just one plant showing central spines but all flowering = mature plants. What ever the name, it was marvellous to see. Thank you for your comment. and what about Escobaria grata? We only noticed these plants from a relatively small area, I can be more specific once I have plotted the coordinates on Google Earth and send you the data. By then I can also include all the cacti that I photographed at each stop, I even take a for the record snap of things that we see everywhere, and that includes Neolloydia. Strange thing is that we saw Neolloydia at all yesterday, unless our strange plant should be one in disguise. Every plant we saw had the look of a young seedling, about to flower for the first time. When Ian spotted the first small plant he said it was a Turbinicarpus pseudopectinatus seedling. At the next stop we had landed in the core of the population. Think of young Neolloydia seedlings before the central spines develop but that look as they are grown on steroids in a dutch nursery. Some kind of neotony? Happy to share the images and location data with you to see if others might recognise it.